Slate is an information management system for higher education admissions and advancements developed by Technolutions, Inc., featuring a robust set of functions and integrations. Technolutions is a leader in the higher education industry and hosts The Slate Innovation Summit every year, bringing together admissions counselors, operations staff, technical staff, directors and deans of admission, from varying Institutions. As a technological advancement, the app deserved a display fabricated with bold and purposeful design. 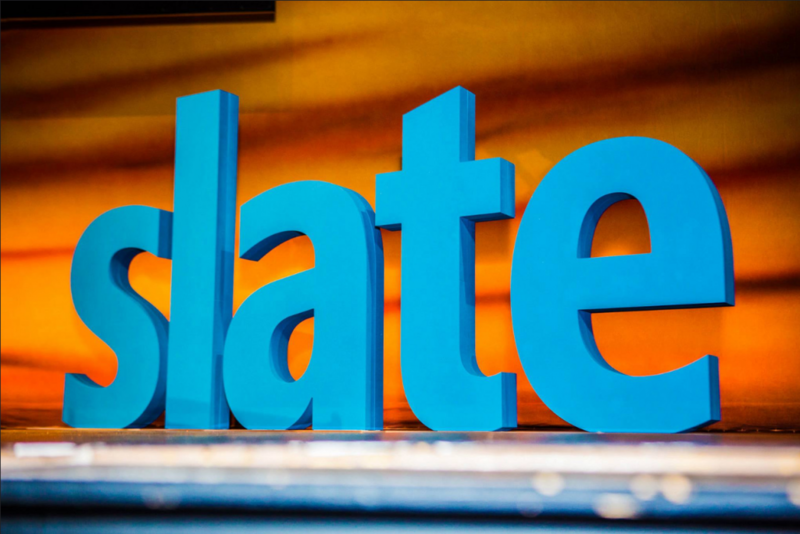 The Slate signage featured is used by Technolutions for trade shows and exhibitions, and was fabricated by InteriorTech Sign Company, a premier interior and exterior signage purveyor local to Philadelphia. Since their start in 1990 InteriorTech Sign Company has grown to serve national and international clients. The sign was developed using two sheets of 2” Gatorfoam® and comes in at 46.625” high by 96” wide and 4” deep. To learn more about the versatility and high-performance of Gatorfoam®, as well as the other products available in the Gator® family, please visit our product page. Credits: Photography and application information Courtesy of InteriorTech Sign Company.